What are the Different Types of Decorative Ceramic Tile? 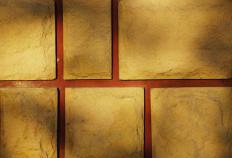 Ceamic tiles are made from natural clay, water and sand, and available in numerous colors and styles. Decorative ceramic tile is a building material used to finish floors, walls, and countertops in homes and commercial structures. It is made from natural clay, water, and sand, which are pressed together before being heated and dried in a kiln. Ceramic tiles are available in a virtually unlimited number of colors, sizes, and styles to accommodate any decorating needs. More elaborate versions may feature intricate designs ranging from flowers to colorful shapes and patterns. Regular ceramic tiles are available either glazed or unglazed. Glaze gives the tile its color or design, or may simply provide a clear shine when installed over the tile's natural finish. Glazed tile is highly moisture resistant, and typically lasts longer than unglazed tile. It's important to understand that if the glazed surface of decorative ceramic tile is chipped or damaged, the tile's natural color will show through, as these tiles are not colored throughout. Unglazed tile is left in its natural state, and may range from red, orange, brown, or tan in color. In the US, the quality and wear resistance of the glaze used on decorative ceramic tile is measured using a rating system developed by the Porcelain Enamel Institute (PEI). The PEI systems rates glazed ceramic finishes from 1 to 5, based on the traffic each can withstand. Class 1 glaze is designed for wall applications only, and is the most fragile and delicate type of decorative ceramic tile. Class 2 tiles should be used for residential walls and floors, while class 3 can accommodate light to moderate use of walls, floors, and countertops. Tile designated as Class 4 is designed for commercial or heavy residential use, and Class 5 is appropriate for heavy traffic situations such as schools or shopping centers. Mosaic tile is a type of decorative ceramic tile that contains pigments or dyes. These pigments provide color throughout the entire thickness of the tile, so that if the glazed surface is damaged, the color will show through. This can often help mask the appearance of small chips or cracks, and results in less frequent tile replacement. Mosaic tile is typically sold in small 1 inch (2.54 cm) units, which can be mixed and matched to create decorative patterns and designs. When choosing decorative ceramic tile, you should select tile that's appropriate for the desired application. Floor tiles should have a matte or low-gloss finish to prevent slipping or visible wear from foot traffic. Larger tiles work best on larger floors, while smaller tiles can make small spaces look bigger. When purchasing decorative ceramic wall tiles, check the tiles' water absorption rate. Those with higher absorption rates are generally softer, easier to cut, and better able to adhere to vertical surfaces. What Are the Best Tips for Commercial Remodeling? What are the Best Tips for Bathrooom Tile Design? What is a Ceramic Tile Cutter?